The curved handle fits perfectly into the palm of the hand to add leverage when separating a Pu-erh tea cake. HongJian mark. 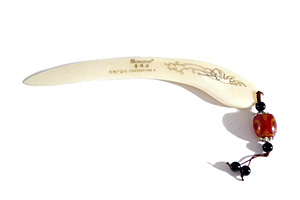 Made of highly polished ox bone with gold flourish motif, this knife has a unique decorative tassel with onyx beads, a melded amber glass bead and cast silver spacers on a silken string. Nicely packaged.